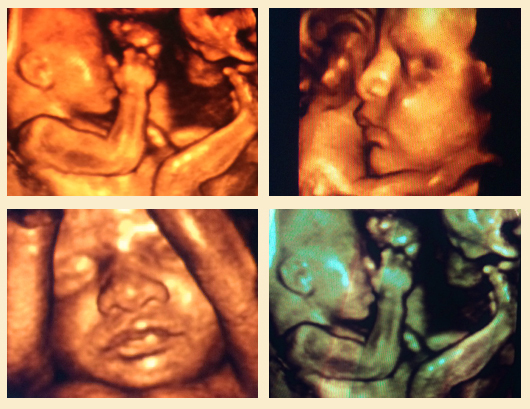 With 3D Live Ultrasound technology you can see the motion of the baby (3D Live / 4D are the same technology). Some companies call it 3D Live and some call it 4D. If your baby has a large, clear pocket of amniotic fluid around the face, is moving about and is developed enough, then we can get great clips of motion (3D live or 4D Effects). The 3D Live/ 4D effect clips are typically only a few minutes. 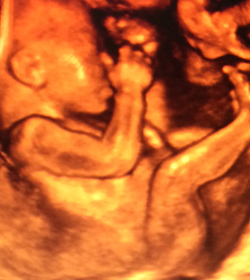 Most 3D/4D ultrasounds are done between 24 and 34 weeks. Prior to 24 weeks, babies have not started putting on brown fat so they won’t have the “Gerber Baby” look. Around 27 to 28 weeks is usually considered the ideal time, because the baby does have some fat and still has plenty of room to move. After 34 weeks, the baby begins to get a little squished and may be facing the spine, which is the position for birth. Why does it matter how much room the baby has to move? First of all, you’ll enjoy the viewing experience more if your baby has room to move around. Often you can watch little hands and feet in motion, toes and fingers wiggling, and see your baby’s face from all different angles. Second, if the baby is in a position that makes viewing difficult (facing the spine or covering its face with hands and feet), you have a better chance of repositioning your baby if there’s room for it to move. Will I get great pictures? Sound waves travel through fluid to create the images. The more fluid around your baby, the clearer the photos will be. Although it’s always good to drink plenty of water during your pregnancy, drink a little extra starting a few days before your 3D/4D ultrasound session. Unfortunately, the location of the placenta is one factor you can’t change. The placenta can be on the front of the uterus, the back, or the side. When the placenta is on the front, it can block the baby’s face, because the sounds waves pick up the placenta as the same type of tissue as your baby. If the mother is full figured, the sound waves have more tissue to travel through which causes grainier looking photos. If this is the case with you, it’s best to wait until around 32 weeks for your 3D/4D ultrasound because the tissue will be stretched out as your baby grows. If the baby is facing your spine, you’ll probably only get a photo of the back of its head or an occasional profile. The technician would then try to reposition the mother in an attempt to get the baby to move. This brings us back to the importance of having plenty of fluid. Dr. Torbati currently provides 3D Live Ultrasound at his private practice located in Tarzana to the following cities: Northridge, Van Nuys, Woodland Hills, Encino, and Reseda.